And our unintentional little spring house tour continues! Like I said a couple of weeks ago in our post about our cozy little breakfast nook’s spring updates, we hadn’t really planned on giving a space-by-space “house tour” here on the blog this spring, but after we challenged ourselves to wrap up tons of projects around the house throughout the month of January with the help of my very kind, very patient parents, it just felt right to appreciate all the hard work we’d done by popping around the house and capturing the spaces as they are in this moment. We always love looking back at old photos of the house and seeing all of the phases it’s gone through. All of the blood, sweat and tears that have gone into making it ours, and we just love that you’ve all been a part of that journey, too! I’m always embarrassed to admit to myself and anyone else that I’m a little bit of a perfectionist because it’s something that I’m genuinely trying to work on and not necessarily my favorite facet of my personality. It can be so… stifling. It makes it a little bit intimidating and uncomfortable for me to share spaces in and around our home that don’t feel totally “complete” or perfectly polished, but when you live in a fixer upper and love the DIY life, you can’t help but start to appreciate the imperfection of it all. Things happen slowly, spaces evolve project by small project by small project and as that happens, we get new ideas and our tastes shift. So what I’m saying is that… nothing in our house is ever really “done done”. Who knows?! We could wake up tomorrow and decide that we want to re-do one of our re-dos, and that’s just who we are! Accepting that has made is so much easier to get behind the promise that I made to you guys at the beginning of the year to share more of our spaces, in whatever state they’re currently in. The good, the bad and the… well I don’t want to say ugly because I don’t like to think of anything in our home as ugly but… you get the idea. So it’s in that spirit that I bring you today’s post, all about a space that we haven’t really paid much attention to up until now and that we in no way feel like we’ve totally “figured out” just yet - our front porch! We’ve toyed with so many ideas for this space. Painting the door a fun, funky color. Adding more planter boxes. Different planter boxes. Different chairs. All sorts of side tables. Varying doormat looks. Different landscaping altogether. The list goes on. Some of it sticks, some of it we quickly decide against for whatever reason and some of it just hangs out there in the “maybe” pile for some time down the road when we’re ready to commit. 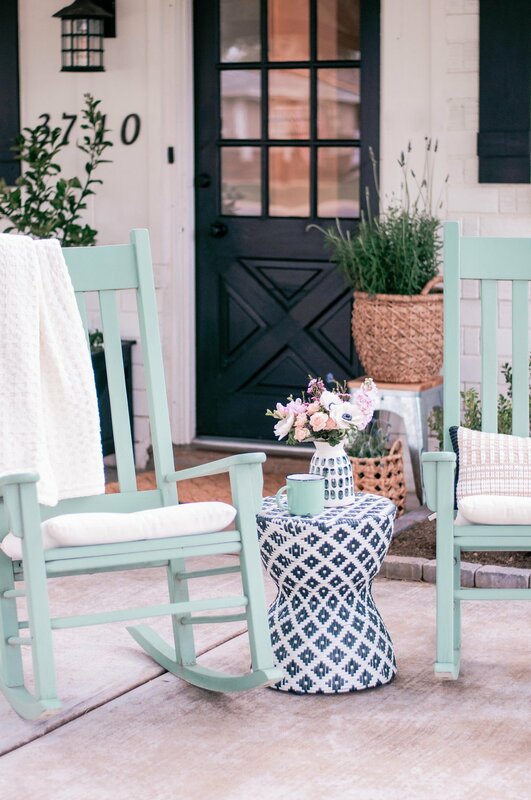 Despite all that, we decided to give our front porch an easy, affordable refresh for spring just to make it a little bit more cozy so we can sit out there and enjoy this beautiful spring weather here in Phoenix, and what you see in the pics is what went down! If you’re interested in seeing what this front porch of ours has looked like over the years or what we’ve done with it in the past, check out our post all about our DIY Painted Adirondack Chairs and our post about the DIY Painted Rocking Chairs you see here - both are fun glimpses into how this space and the furniture in it has evolved over time! So what’s new around our cozy little cottage-farmhouse front porch/patio? Well, we added a fun new woven side table to sit with the rocking chairs, which we loved so much that we went back and bought more for the fire pit in the backyard. We sanded and painted the planter box again because it was starting to look a little bit sad and planted a new nectarine tree in there because the lime tree that used to be in there wasn’t entirely happy in that spot (that got transplanted to the backyard where it’s now thriving - so exciting!). We added a fun new braided doormat which I’m absolutely in love with, next to a couple of new braided baskets, one of which is set on top of an old galvanized stool that we had hanging around somewhere in the house. We also grabbed this fun new outdoor pillow because it was just too perfect to pass up! Like I said, we’ve thrown around so many ideas for this space, and this setup you see here probably isn’t permanent, but we do love the planter box that Chris built, the dwarf citrus trees we always plant in said planter box (especially when they fruit!) and of course, the fact that we have two really comfy rocking chairs out there that allow us to take in the sunrises, sunsets, neighborhood pups passing by and our pretty little view of Camelback Mountain. But what I’m really interested in finding out is what you guys would do with this space. It’s a little bit of a blank canvas right now in some ways, so would you add another planter box? Different chairs? Make them a different color? Would you paint the door? If so what color would you choose? Or would you keep it simple and minimal? Tell me what you think in the comments section and don’t leave anything out - I love dreaming up spaces with you guys and letting our imaginations run wild together! Sharing is caring!